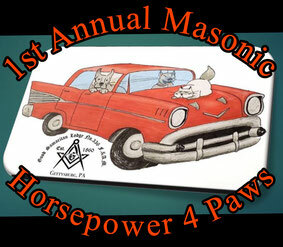 The 2019, 1st Annual "Horsepower 4 Paws" Car Show will be held on Saturday, June 15, 2019, from 9:00am to 4:00pm at Gettysburg Elementary School, in Gettysburg, PA. Admission will be $5.00 per person, or free admission with the donation of a pet item. (Toy, food, day-to-day needs, etc.) Children under the age of 12 years old are free. It should be noted that the proceeds from this event will be disbursed to the Adams County Animal Shelter, or one of the other various charities supported by the Lodge. The trophy presentation for this year's event will be held at 3:00pm.